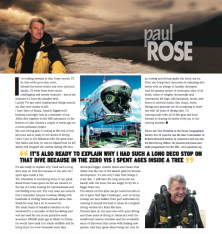 Paul Rose celebrates his lifetime of diving with us every month. Working in Antarctica presents some real problems: We are at the end of the world’s longest supply chain, the science projects are quite rightly ambitious and the science support logistics are always under extreme time pressure. Ships being stuck fast in the ice for weeks, extended periods of bad weather making it impossible to fly or operate boats and vehicles, being stuck in the tent for days, endlessly digging out depots and snowmobiles are all expected events and we handle them as routine. But laundry powder? Our season was hectic as usual but with no big problems. In fact the only snags that year were problems related to our ordering system, which meant we had a mountain of pink blancmange, no Guinness and the world’s largest supply of variable geometry toilet paper that didn’t fit any of our paper holders. So when I received complaints that some people were allergic to the new “biological laundry powder” I figured that it was just another sign that this would be a domestically challenged Antarctic season. This laundry powder problem burbled away in the background for weeks and eventually came into focus when I realized that it was only the dive team who were affected. Had they all gone soft? But my thinking changed when I checked the dive logs and saw that all of the divers who had reported allergies were those diving at the north end of the runway. A great majority of our marine science dive sites were close to the base and with easy access so that we could establish long-term data sets. And one of the most efficient and simplest was the sediment-coring project at the northern end of the runway. Our usual routine was to load the scuba, science and support kit onto a vehicle outside the lab at the southern end of the runway and while it was being driven up we could take an easy walk in our dry suits to the northern end. This was great as in that 1km stroll we warmed up, got dive bombed by skuas and enjoyed the fabulous views. The dives were straightforward: An easy descent down the rip rap to 15 metres and then the natural rock slope led to a muddy bottom at about 30 metres. Once there we took a series of bottom sediment cores from the correct area, brought them up in our goody bags, loaded them and our gear into the truck, repeated our leisurely skua attack filled walk back to the lab and walked directly into that lovely hot shower to rinse off the suits and warm up. Piece of cake. Except when you dive during periods of extreme low atmospheric pressure. We had just had a run of low pressure systems with a bottom of about 974mb which is equal to 300 metres in altitude. This meant that we were in effect diving at altitude. Even though we were using the cold water specific DCIEM (Defence and Civil Institute of Environmental Medicine) dive tables they were not conservative enough to account for our “altitude” diving. The low-pressure effect combined with the skin flushing from the runway walks was just enough to provoke mild decompression sickness. I double-checked everything with our great support team at DDRC and sure enough, my divers had skin bends! The amount of debris entering our seas is so vast that it’s practically immeasurable. To raise awareness of this issue I’m leading another day of “Ocean Debris” dives in Lake Windermere. It’s free, fun and helps focus attention on the disastrous practice of treating our seas as if they were bottomless pits for all of our wastes. And might just might help stop people throwing rubbish into our beautiful lakes too. On Saturday 2nd March we’ll make a series of dives in the Bowness area of Lake Windermere to collect debris from the lake bottom that has accumulated over many years. This underwater “treasure” will be transformed into beautiful sculptures and objets d’art by school groups. These works of art will then be displayed and auctioned to raise funds for charity. Details are on my website and I look forward to seeing you there on Saturday 2nd March. I’m on one of those journeys: The taxi arrived a bit late, the train to Manchester airport was late and then got caught behind a slow train, the flight to Zurich was delayed, the connecting flight to Geneva very nearly got airborne but after an hour of de-icing and taxiing to the runway we couldn’t take off due to more snow on the runway and a big crosswind. As we turned back here to the terminal I thought we should at least have had a go at taking off. I’ve got a week of cross -country skiing in the Swiss Jura and a couple of dives in Lake Geneva planned. Well worth taking a few chances for. But as pilots say, “I’d sooner be down here wishing I was up there, than the other way round”. So at 0500 here in Zurich airport with a nagging worry about my luggage, a blimin’ awful cup of tea and plenty of time on my hands I am reflecting on those dives when I really did wish I was “up there rather than down here”. In 1977 I dived the car ferry Milwaukee in Lake Michigan and was with the legendary John Steele who had found her in 1972. She’s a big ship with lots of gear and we had plans to bring up some treasures for the museum and also to salvage one of the cars. We moved along a rail at 40m in very low visibility, high silt conditions and I was hoping for a fairly easy dive so that I could get oriented. We dropped off the rail, came to a small square hatch and as I looked inside I could feel John pushing me to get in. With no plans to penetrate the wreck, no reels, only one light, a big back mounted twinset, a leaky Unisuit and a general lack of moral fibre, I didn’t feel at like forcing my way into this uninviting hole. But I wasn’t brave enough to resist John’s pushing. After all, he had found the wreck and is the legend of Great Lakes wreck diving. So I relented and in an effort to show some willing I made a half – hearted show at wriggling in. John felt this and really went for a huge push and I could feel him forcing my weight belt over the bottom lip and pushing the top of my twinset under the top lip and with another almighty push I squirted in! I remember hoping that John wouldn’t follow so I popped my head out and gave him a signal to not follow and I was OK. John gave me an OK and swam off into the gloom. I still remember hanging there with my head and one arm out of the hatch with the single comforting thought being that the leaking suit would cover up the evidence that I had peed myself. I didn’t look around inside at all. I just worked at getting out and made one of those horrible grunting, scraping attempts and then slowed down, thought through things and finally came out part way on my back to be brought to a full stop at waist level by my beautiful Ikelite torch and it’s too long lanyard. This torch had cost me a fortune but with no hesitation whatsoever I cut that lanyard. By a miracle when I got out and looked back, the torch was sitting close to the hatch and when I reached in I saw that it was next to a brass lamp just wedged against a pipe. So with lamp and torch in hand I tried to find our anchor line but I didn’t have a clue where I was and I became fixated with the idea that I could easily find myself inside the car loading doors. With no real options I started up through the gloom in open water. I had just read Ern Campbell’s “Ten Foot Stop” notes and so I made a 5-minute stop at 10 feet and unbelievably saw John’s boat above. John had finished his dive along the rail and came up the line. He said, “You’re mad. I never would have gone in there, but seeing how determined you were I just had to help”! Other times when I have wished I was “up there, rather than down here” include: Running out of air at 70m in Antarctica, getting very lost under the hull of an iron ore tanker on an inspection dive and getting run over by an iceberg in Antarctica. I’ve survived these little events so why not let us take our chances with a hairy takeoff attempt at Zurich? Next year I have big plans on the Torrey Canyon and it’s been fun to look back at my last dive on her. On the morning of Saturday the 18th March 1967, the largest oil tanker in the world at that time, the mighty Torrey Canyon ran aground off the Cornish coast. At time of the disaster the skipper had plotted a shorter than normal route, in effect cutting a corner, and it was the ship’s cook who was on watch in the bridge. There was widespread confusion about how to deal with massive spill. A decision was made to bomb the wreck and it’s oil slick in a attempt to burn the oil. The Royal Navy were rallied and they led the bombing runs dropping 62,000 lbs of bombs, 5,200 gallons of petrol, 11 high powered rockets and an undisclosed amount of napalm on the wreck and the surrounding waters to very little effect. The 20 mile long oil slick reached the Cornish coast in a few days triggering a massive environmental catastrophe including the death of over 25,000 sea birds. The familiar golden sand beaches were totally black and no life existed on any of the sea cliffs. In spite of cleaning car tyres, and workers boots the heavy black crude made it’s way into the streets, shops and people’s homes. The fumes could be smelt throughout Cornwall and with the bombers flying low making their runs to the wreck site one could be forgiven for thinking that a version of black hell had arrived. There was a dire need to “do something” and so a huge clean up operation began including widespread use of detergents. These were such aggressive chemicals that many of the beaches and cliff areas still show signs of their effect. Six months after the spill some untreated beaches had returned to a pristine condition, whilst the treated beaches had become a wasteland. Nineteen days after the wreck it’s massive oil slick hit western Guernsey and in a reaction similar to the Cornish the authorities decided to act fast. Tourism, then as today was the island’s main source of income – the beaches had to be saved. So in a desperate, fast and furious 11 days they managed to scour the beaches clean by collecting __ tons of the crude and dumping it into a disused quarry. The beaches were saved, but a visit the quarry is a sobering experience. A lot of oil is still there today. For my dive we were blessed with good weather and at the wreck site we could easily see both Lands End and the Scilly Isles. The currents in the area are powerful and the dive can only be made at a tidal slack. We had arrived just before low slack and could identify the tops of the rocks by surging seas and waves breaking over them. The immeasurable power of the sea makes this an exciting place. Kitting up for the dive, rigging of the dive gear and transferring to the inflatable was made hard work by the never-ending swell, constant big surges and some crew sea sickness. But we had timed it perfectly as it was rough enough to do justice to the story of the wreck, reveal the power of the area and still be diveable. It was a great, vibrant start to the dive, but it looked to me as if we had missed the Torrey Canyon completely. After all she is said to be well broken up over 2 square kilometres of the sea bed. I then realised that I was on the wreck – the huge hull plates have so much life on them that they look just like rocks or the bottom. Things then started to make sense and as I swam along the steel plates I joined large schools of wrasse, pollock and pouting some of the schools were moving purposefully along the wreck sides and others had relaxed into shoals underneath and inside the wreckage. This was a beautiful, vibrant dive full of life. I used the big surges to drive me forwards and then I held on during the backwash so I made good fast progress around piles of machinery, winches and twisted steel plates all completely camouflaged with weed, anemones, briozoans, starfish and colourful urchins. As I whizzed round the corner of the superstructure I hovered over one of the many bombs that had been dropped on her and was relieved to see that it had exploded, but it was a healthy reminder that there are hundreds of unexploded bombs on and nearby the wreck. I was delighted the Charles had found the bridge and Gavin, our underwater cameraman, and I squeezed through the passageway and hoped for still water. But there was no chance of that, so we wedged ourselves in as best we could and I was able to tell the story of that scene on the bridge of the largest super-tanker in the world, cruising along in good weather, making good time, watching the birds, reading, enjoying a cup of coffee as it would be a very well tested routine job. And then; The unthinkable, she was aground! I can well imagine those seconds of unreality followed by shear panic and the overwhelming gloom and horror that they had triggered our largest maritime environmental disaster in history. When I am asked for an environmental comment on 43 years of diving I always say “Less fish, more plastic”. This might seem a flippant comment but it’s true – there is not one single bit of our beautiful life giving oceans that does not contain plastic. Are we ever going to get a grip on the twin lunacies of treating our seas like a bottomless rubbish pit whilst at the same time engaging in over-fishing? All of our of great organisations and programmes such as PADI Project Aware, Plastic Oceans, MCS, Ocean Elders, (there are so many the list could fill the magazine) local initiatives and the newly formed Ocean Health Index are all working at full steam to raise awareness of the problem and to provide guidance for policy makers and our fearless leaders. But we fall into the obvious trap of communicating a large global issue: We are always speaking to the converted, or at least it’s only the converted that seem to be listening and the actual evidence of the problem is far removed from most people’s daily lives. So what do we do? Obviously we need to keep supporting local and global initiatives. With our support they can keep awareness levels high, keep the pressure on influential change-makers and most importantly influence the next generation. And naturally we keep up our tireless and fun vocation of diving with a high regard for ocean ecosystem protection – we know it’s setting a great example for the next generation. To make this work more effective and reach people who are somehow removed from nature and environmental concerns we need to be creative. A brilliant example was Selfridge’s Project Ocean last year which really did “bring the oceans” to central London by making a bit of London an “MPA”. It was an inspired idea and reached a large urban audience who might well have not attended a public lecture on over-fishing or would have switched the telly off at the first mention of ocean ecosystems. I suppose we could copy the protest method used by angry farmers who used to dump farm animal waste outside the Council offices to make a point. They have the advantage of living alongside their weapon of choice and the timing for those protests was perfect. Collecting ocean debris and dumping it outside Number 10 somehow doesn’t feel the right thing to do – yet! But I’m here in Switzerland and have just been part of two great initiatives that remind me how effective a little innovative leadership can be. The Zurich Museum of Design, “Out To Sea?” exhibition is a very powerful experience. The main hall is completely filled with the amount of debris going into our oceans every 15 seconds. It’s a striking experience reaching large audiences. And yesterday I dived here in Lake Geneva with the dive club Subaquatique de Vernier as part of the Net'Léman clean up campaign. It was the type of clean-up dive that we have all been on many times – a great social event feeling, lots of divers and beach volunteers, a huge amount of lake debris collected and all displayed prominently by the lake as a powerful message. These two great examples of water / ocean debris awareness campaigns from this landlocked country are reaching big audiences. So maybe that’s the trick – if we have clean-up dives in inland urban environments and roll out the “Out To Sea” exhibition in other locations we can reach a lot of people with our ocean debris message. I’m taking this to heart and when I get home to Windermere I am organizing a Lake Windermere debris dive for this winter. I feel if Switzerland can show leadership on ocean issues then why not the Lake District? See you in the lake and if that doesn’t work you might just see me on Downing Street with a full trailer! “Put the regulator back in!” shouted Mike Pitts. And quite rightly, as there was enough rust in the air pocket to easily use up the oxygen. I knew that. I have been in similar situations in caves and wrecks all over the world. However tempting it might be never, ever remove your regulator and breathe some horrible unknown gas mixture. Mike was faced with problem – he was trying to look after me by removing his own regulator to shout at me. Which of course meant that he also breathed some the unknown air. I was happy to take my chances. In my imagination I was right there alongside Jacques Cousteau and his silver suited oceanauts. It was 1963 and we were living in our underwater habitat Conshelf II for a month. I was as the very front end of saturation diving experiments, using the diving saucer, cruising the medical experiments and technical workload and taking my turn to live in the “deep cabin” at 30 metres for a week. As it was, in 1963 while the aquanauts were breathing revolutionary heliox and discovering new species, I had already failed the 11 Plus and was busy preparing to fail the 13 Plus by laying in the bath with my mask and snorkel and dreaming of being a diver. We had started our Red Sea expedition in Massawa, Eritrea and after surviving the paperwork and permissions battlefield we headed out to the fabulous reefs. Compared to the busy north, these reefs are virtually un-dived with only about 100 visitors each year. My first dive on the reef was about what I had expected – a beautiful drift across a thriving, vibrant, pristine ecosystem. But at night things got complicated and even more beautiful. These reefs have developed a special resistance to high water temperatures. The upper limit for most corals is 28C, but in Eritrea they are bursting with life at 34C. This is because their symbiotic algal partner has evolved to be tolerant to heat. During daylight we can see the effect of this survival strategy demonstrated in the beauty if the reefs. But at night we can actually see evidence of the algal proteins in action – they fluoresce. So that’s why I found myself wearing a yellow filter over my mask and shining a blue filtered light across the reef. This combination reveals the fluorescing proteins in a fantastic light show. 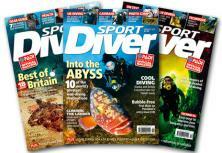 I was totally mesmorised on those dives, they were just too beautiful to describe. I remember taking coral growth measurements, running a tape measure and positioning the quadrat for our survey and at the same time I was supposed to be explaining how the coral polyp symbiotic relationship and survival strategy has developed. In particular I had to report on the possibility of transplanting heat resistant coral algae into threatened coral as a “booster vaccine”. But I was so overwhelmed with the sheer beauty of the dive that prompted by the surface to explain how this all works, the best I could come up with was “When I turn the blue light on, the coral glows. When I turn it off, it doesn’t”. Jacques Cousteau called the Red Sea a “Corridor of Marvels” and our journey from Eritrea to Port Sudan gave me yet another sense of the true beauty of the Red Sea. Those weeks were just perfect – heat resistant corals, shipwrecks, hammerheads, silvertip sharks on the deco stops, a sailfish so close to me that I thought it was Mike, circuit training on the upper deck, dancing on the rear deck buying a bicycle in a Port Sudan market and surviving the foul air on Conshelf II. I was on the Greenland icecap working for a science team at the great moment when we won the Olympic bid in 2005. I made a satellite phone call home and just whooped when I got the news. I’m from Essex and know that massive old industrial area near Stratford very well. It would be an enormous task to clear the contaminated land, open canals, remove those huge pylons, build infrastructure and venues and then run a fantastic Olympics. I was desperate to be part of it. At the very moment I got the news I was emptying one of our toilets and carrying the heavy bag of poo off the icecap to my burn site on a rocky section of the nearby tundra. Our work on the icecap was to collect ancient methane from the ice for climate change studies and we had to operate in pristine conditions. We collected this important gas by mining about 20 tons of ice, melting it and then drawing off the air from that ice. It was three months of really good hard labour, running a small industrial plant in a marvelous location. But keeping things clean was a big job and part of that included the removal of all of our human waste. I tried to work out a way of sending it back to Ilulissat but there was no way the helicopter pilots were going to carry our arisings. So the best I came up with was to carry them off the ice each day and incinerate them. That day in 2005 I was so excited about the Olympics that I used a complete jerry can of petrol to start the fire and I remember leaping and dancing around those flames in celebration. I couldn’t compete in the Olympics as there are no poo flame dancing events but I did get the job of moderating the Olympic “Human Performance” discussions which were insightful and great fun as I worked with top athletes, trainers and sport science experts. There was no time to enjoy more of the wonderful Olympic atmosphere as after the last session I came directly back to Constable Point in Greenland to run a zodiac in support of teams working in Liverpool Land, Milne Land and Renland. When I was here in April I had hoped to use snowmobiles to travel the frozen fjord system to start the ski mountaineering journey. But the sea ice was in terrible condition with large areas of open water, big open leads close to the icebergs and the entire ice surface was wet, heavy and rotting fast. So we had to use a helicopter to skip the fjord section. As I cursed the bad ice conditions then I’m now enjoying the benefits of a warm season as we have no sea ice in sight at all. There are some large bergs in Scoresbysund Fjord and naturally bergy bits close to the bergs and glacier foots. But realistically, it’s open water. We’ve got some long trips ahead: 150km to Renland and 120km to Milne Land. So to break the journey we’ll be camping on some beautiful and remote beaches and islands that normally would be ice covered. This makes it easy for camping but there is no ice on the beaches to melt for drinking and cooking. So the trick is to collect good ice during the day. I’m wondering how the lack of ice will affect the polar bears in this area. I carry an extensive bear kit including a rifle, flare gun, hand-held flares, mini-flares and bear spray. I haven’t seen any bears yet and as I start the first boat run I’m loving the expectation of narwhals, minke whales, walrus, beluga, seals, musk oxen, Arctic foxes, geese, ducks, puffins, Arctic terns and even Greenlandic sharks. It’s wonderful but I wish I had my flippin’ diving gear! Thank heavens that Oceans is running on BBC again. Since the first transmission it’s been running overseas, on cable and long haul flights (I still can’t get a free upgrade) so I assumed we wouldn’t be seeing it back on BBC2. But thanks to some enlightened management of the repeats schedule we’re back on! I caught the Sea of Cortez episode last week and I’ve been having fun doing ’behind the scenes’ tweets, reflecting on a great journey and thinking about our sharks. Our boat looks just great in the film. She’s got good purposeful lines and that new blue paint job sparkles in the HD helicopter shots. But close up it was another story. We arrived to find panic work in progress with what looked like a season’s work left to complete. So we had to play that exhausting game of keeping the pressure on the jobs and yet at the same time try to appear relaxed and easy going so that they wouldn’t just walk off the boat. Anything, other than appear to be yet another pushy media crew. It means patience, big smiles and cold beers. We are good at this and we only lost a couple of days. Jacques Cousteau’s team filmed hundreds of hammerhead sharks circling the Sea of Cortez seamounts. It was those films that made the Sea of Cortez an essential destination in my planning. I remember that the pre-dive anticipation feeling was particularly sharp as I was rehearsing my lines about how the hammerheads move, navigate and hunt. And there was a palpable sense of excitement as we plotted camera positions, my movements, lighting, safety and all the usual underwater logistics took on a special brightness. We were going to film hundreds of hammerheads! But we all know what happened; Zero. No sharks at all. I made that series of long dives on the same seamount where Cousteau had seen hundreds of hammerheads and naturally I expected to find some. My primary story was to dive with hammerheads to reveal the true beauty of these amazing hunters. I called them the fighter pilots of the world’s oceans. But I also firmly had in mind a plan to report on the horror of the shark finning industry. With no sharks seen, it was this story that had to lead. No matter how many times I read, write or say this, it always makes me jump; We kill 100 million sharks a year. Some for shark fin soup, some as by-catch and the rest for ‘sport’. So it’s no surprise that a massive amount of shark fishing in the Sea of Cortez has changed the natural balance of the food chain. Humboldt squid are impressive survivors and are thriving in the gap left by the sharks. Their story reflects the power of nature and almost impossible beauty of the sea. But I hated them! The squid invoked my fear of ‘creepy crawlies’ (I do anything to keep away from spiders) and on top of that they have a fearsome reputation and are very smart with it. Their eyes are very similar in structure to our own so when they looked at me I could sense their big brains working things out and they gave me a look that said they knew exactly what I was up to. We had heard stories of fishermen being dragged overboard by the squid and of divers being unable to surface because of the number of tightly packed squid above them. These awesome, but truly gruesome beasts weigh up to 50kg, approach aggressively and at high speed, change colours in a flash, hunt in massive packs, have tentacle suckers lined with sharp teeth, kill with their powerful beaks and are cannibalistic. Nobody could love them, but they were essential in my quest to report on changes in the food chain. We need all the help we can get in the fight to stop shark fishing. After five weeks of ski mountaineering in Greenland I’m having the usual urbanization re-entry problems; Looking at this laptop and the 15,026 unread messages is a bit like looking at someone else’s life. London felt hot, busy and crowded. And the admin piles on the desk and the floor haven’t yet succumbed to my double-handed battleaxe technique. So as normal I take refuge in the next adventure – sailing a beautiful original Yorkshire Coble in the Queen’s Jubilee Pageant. She’s called Gratitude and is the last one of her kind, so we must look after her and keep a safe distance from the other 999 boats on the Thames. We start at Dove Pier at 0630 and should arrive into West India Docks about 12 hours later. She’s just a small working boat and there is no toilet onboard of course and as we’ll be in the public eye there’s no chance of going over the side – so we have rigged a small porta-loo and a tarpaulin. I’m not sure if the best technique will be to get completely under the tarp or I might just try keeping my head sticking out and look as if that’s the way I always sail. Either way, organising sailing kit is a marvelous excuse for ignoring all this deskwork. I often take solace in my equipment, it really helps me make an essential connection to nature. This kit room could easily be mistaken as a prop for one of those terrible TV programmes about people who hoard rubbish for years and end up living in tunnels underneath their collection. I do throw things away, but never books or any of my equipment – it’s all means too much to me. And as I work across a nice big range of activities I get excited about being able to go from one to the other without that terrible business of finding things in cupboards, or boxes. I just have it all on display and live right alongside it all. I can go from Arctic skiing to Thames sailing in about five minutes. And next week when I’m diving off Poole for my next television programme I know I can get my media diving rig together in flash. Even the old kit lurking in corners comes up trumps as I often need odd bits and pieces. Just before leaving for Greenland I had to fit new heel lifts on my telemark skis and I found a great set on some nasty old Marker bindings. And for the filming in Poole I had hoped to use my parents’ old full face masks with ping pong ball snorkels attached. But can you believe it – they’ve been thrown away! They fell victim to the Council loft insulation team at my Mum’s house last month. Disaster. But I’m grateful for the opportunity to scratch around looking for other fun diving things as it’s keeping me out of trouble and away from the dreaded deskwork. So far the pile next to me includes a commercial underwater metal detector, a marvelous jumble of floats, buoys and SMB’s, cave reels, a grappling hook, regulator first stages with ten metre inflation hoses, canvas bags full of spanners, cable ties and binding wire and a dowsing rod. And my emails are full of last minute exchanges about whether metal detecting dowsing rods and pendulums might work underwater! Once I’ve sorted out this equipment I can finally get back in the water. I haven’t been in the sea for months and the two days of diving at Poole next week will feel great. Even though it’s a piece of television work, so therefore means full face masks, comms and all the media palaver, I’m already excited about the feeling of that cool water coming in the suit and that wonderful familiar feeling of freedom that reminds me of why I am a diver. I’m going to be in UK waters a lot this year and hope to see you there. I’ll be the one with a big grin looking as if he’s just escaped from the desk! Well, I always imagined myself writing these columns from exotic dive destinations. Maybe swinging in a hammock on the Red Sea coast feeling that hot desert wind, half falling asleep on a warm boat deck in the Bahamas, or even pushing the limits of how much sand I can get in this laptop from a windswept beach in the Indian Ocean. As it is, I’m writing this one from Greenland and I’m not even on a dive trip. I’m in my tent at Nerlerit Inaat on the east coast, it’s -17C, blowing a hooley, my gear is not organised, the dogs are howling, I have just spent hours digging out shipping containers, snowmobiles, fuel drums, storage tents and sledges. This is a flippin’ long way from tropical diving writing! If things calm down overnight I’ll be heading south leading a team of four people for four to five weeks to attempt a new 250 km ski traverse of Knud Rasmussen Land. We’ve got big plans – it’s a world's first crossing of the Knud Rasmussen ice field, a fabulous looking area that I flown over and always wanted to ski across. And on the way we will attempt a number of unclimbed mountains and travel new glacier routes enroute to Gunnsbjornfeld which is the highest in the Arctic. I’ve climbed Gunnsbjornfjeld before and it’s a great experience. The climb itself is beautiful and from the summit we see thousands of unclimbed mountains and unexplored territory. The feeling of travelling new ground in remote places is something that I cherish. I’ve been working in Antarctica since 1990 and here in the Arctic since 2002 and no matter what the type of work – science support, logistics, or mountaineering, it’s the vast open spaces and feeling of being in a true wilderness that excite me. But because being underwater is such a powerful experience, it’s diving that fires me up more than anything. There is something so beautiful about being underwater. I really am defined by diving and I live for that sense of freedom and vitality that comes with being a part of the largest, most important and least understood ecosystem on the planet. In about four weeks or so I’ll be savouring that great food and lovely drinks in Iceland while we hopefully celebrate a successful expedition. I can also guarantee that the first activity when I get home here to the Lake District will be to get over to Hodge Close and have one of those easy, lightweight, no-brainer dives in the clear, cool waters. During that dive I’ll be doing my usual trick of thinking of absolutely nothing with a totally clear, empty head whilst swimming in circles until I’m low on air. With that out of my system I will then concentrate on getting back in the sea as soon as possible and enjoying some great British diving. It sounds like heaven at the moment! My route to working in the polar regions has been Science Support and so naturally I bang on about the importance of getting any skilled trade that you can and then apply it to science. To work in the field, scientists need all of the skilled trades. So hang in there with your apprenticeships and look forward to the day when you are working alongside great science teams as; a mechanic, plumber, electrician, boat driver, diver, builder, heavy equipment operator, cook, mountaineer or IT specialist. And recently I’ve seen an increase in the number of university graduates who are then taking time to get experience with practical skills so that they become more employable. I clearly remember the time: Jacques Cousteau was on Calypso, Hans Haas was making shark films and my ultimate hero, Mike Nelson, was having proper diving adventures rescuing men from flooded mines and all the beautiful women wanted him to teach them to dive. I had just failed my 11+ and knew nothing except that I just had to be a diver. A lifetime passed, actually seven years but it certainly felt like a lifetime, and I was finally a diver. I can still feel those dives at Chesil Cove – carrying the boat, engine, fuel and gear across the stones, getting suited up in the Easter sleet into my home - made wetsuit (black with yellow seam tape of course), and then dropping in to that marvelous clear, surging, crab and weed filled paradise. I shall never forget the feeling of the sea coming in my suit and that vital sense of freedom. 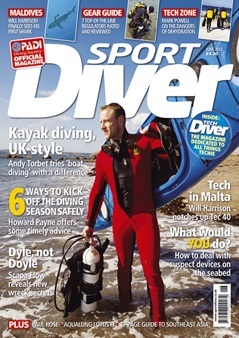 In the pubs I would stand a bit straighter, puff out my chest and say “I’m a diver”. Another lifetime whizzed past, ten years this time, and I was PADI Instructor 12314. I had a van full of diving gear and was teaching dive classes at the YMCA, for the Police, underwater recovery teams, private classes and shop classes but I still had to work at Johnson Outboards to pay the bills. And then by a miracle I got a contract to teach diving at Great Lakes Naval Training Centre and also some work diving contract work for US Steel in Gary Indiana. I shall never forget how it felt to walk out of that factory for the last time! I swapped my factory life for great selection of diving work; I bought an Advanced Swindell helmet, a compressor and comms unit to pack in that van and started work installing air curtains at the US Steel works and cleaning filters around the massive water pumps. There’s nothing quite like being sucked across a steel floor in almost zero vis, incredibly noisy swirling water towards the next pump screen to fix. I ran an old open circuit regulator on a 15 metre hose from a set of twin 80’s so that could do boat hull cleaning and just used a window glass suction handle to hang from and a sponge, scourers and brushes to make some pretty good money. And of course I really ramped up the PADI diving classes and taught anybody, anytime, anywhere. I couldn’t stop working – that sense of freedom and actually working as a pro-diver made me unstoppable! Diving is the activity that defines me and I still love any opportunity to say “I’m a diver” And on my desk is that lovely little PADI paperweight helping me celebrate 30 years as an Instructor! We headed east, away from the Zanzibar coast and the heaving sea changed colour from the near-shore bright blue to the true deep ocean BLUE. As our ship rose to the huge swells I was comparing our oceanographic mission, which was to deploy a Meteorological Office ocean buoy stacked with the latest technology and supported by a network of satellites, with the early ocean studies. 243 Crew. 6 Scientists. 4 years at sea. 68,890 miles. 492 depth soundings. 133 dredges. 4,700 new species discovered. The deepest part of the oceans discovered. And the first plots of the world’s currents. But – working out the data was a massive job. The reports were 30,000 pages long in 50 huge volumes and took 19 years to produce. Whereas these days we can deploy remote sensing equipment like our Argo float and immediately get access to the data. Not only that, but at the same time we can access all 3000 Argo floats and countless other remote sensing units – automatic weather stations, geological sensors, airborne instruments and satellites. This is the first time in history that we can monitor our planet in such detail and in real-time. Even better – you don’t have to be a scientist to do it. It’s all free to anyone with internet. The responsibility of deploying our Argo float stopped me dreaming. I only had one chance to get this right. Firstly we had to get to the right place – we needed water depth of at least 1000 metres and preferably needed 2000 metres. This meant a long passage against these big seas during which I had to commission our float. Commissioning involves some final assembly, turning it on and then securing it upright for 6 hours so it can send and receive test signals to the satellite system and the Meteorological Office. The countdown begins when the unit is turned on and after 6 hrs it makes it’s dive to 1000 metres, so we had to be there on time. Once we arrived on station I was getting frustrated waiting on the surface as the big swells lurched the float up and away from my reach. It was impossible to launch it smoothly – I felt I was in a wrestling match with it. Eventually I got it off the crane and swam it clear of our heaving ship. This felt great - just me and the yellow float 10 meters below the surface, 1000 meters of water underneath us. I checked my watch and as the second hand came round to the 6 hrs the float systems took over and she started to descend. For a while I could see the bright yellow shape, then it became a yellow circle, then a white dot until finally it disappeared into the blue depths. I checked my depth gauge and it was clear that I had become a victim of ‘blue orb syndrome’ as I was thinking 10 but was now at 30 metres. Waving off our Argo float was the best way imaginable of putting remote sensing science into a human scale and contributing to citizen science. 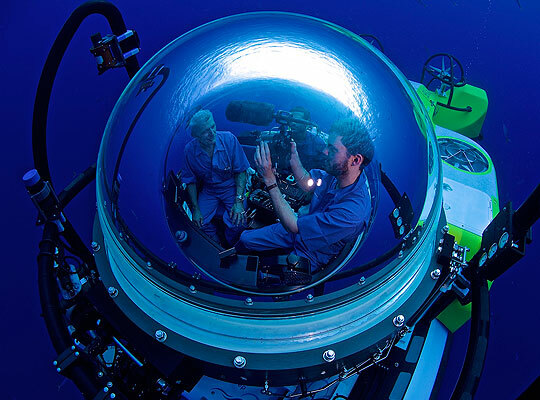 So modern Argo technology is a massive resource for those of us learning more about our oceans. But the traditions and laws of the sea never change as demonstrated by a Zanzibar fisherman a few months after we deployed our unit. He happened to be at the right place at the right time when our Argo float surfaced close to him. He promptly brought it onboard and returned it to his yard in Zanzibar claiming salvage rights! It’s cool to be in Quarantine. You’ve arrived but can’t actually get amongst things at the new port because the authorities assume you have Cholera, Typhoid, Vermin, Yellow Fever and Stowaways. Which is great, because it forces you to wait for a while and soak up the sense of arrival, get the appetite fired up for ice cream and find your one set of long trousers. It’s cool for a while. Because convincing the health officials that you don’t have any pestilent diseases is only the first step. You are still not free – it feels so close. There is an ancient ritual quest to follow for the rest of the official entourage which includes costume, drama, respect, open warfare, sabotage, confusion, villains, the emergence of heroes and most of all pride. The Oceans team are good at this rite of passage; The trick is to not let on to the enemy that we are good at it. So we play the game and are delighted when asked to present our passports, visas and various permits. We can’t thank them enough when they check every single item from our hundred and fifty odd boxes and we squeal with delight when they search our cabins. And it’s a wonder that we don’t all have simultaneous multiple orgasms when they announce; There Are Problems. They need to frighten us. We look frightened. It goes quiet. Respect is dripping off the walls. Pride is everything – don’t even think about your own. The traps are set. It’s serious in here and while we sit at the best table in the boat’s saloon sweating this out, others in the team are playing a pantomime version of hide and seek with the beer and the supposedly secret, Security Chief; It’s him! It’s him! They point out in stage whispers to the beer carriers. The Secret Security Chief is oblivious to this farce going on behind him. He turns, the beer goes up a deck, he turns back, it comes down halfway and someone panics and points again, It’s him! Arrghh! Up, down and round the decks they go until they make the slip and stash the beer in already searched cabins. In the stifling saloon we wait while they talk amongst themselves. It looks bad. None of them look at us and they handle and look at our papers in that well-practiced way that says the ten months of hard paper pushing was worthless. We keep silent. We’re mindful of the trap’s hair-triggers. Their tone begins to soften and out of the blue we get it; Their benevolent smiles are worrying at first. No need to worry, everything is OK. Big smiles. Your papers are in order and please, please enjoy your time here. Thank you for the tea, we are busy and important people so must dash. Thank you for your hospitality. Everyone is randomly thanking everyone. They leave in a last flurry of formality - pride intact, thinking they won. The sweat in our long trousers begins to dry as we wave them off imagining their fly blown offices full of mouldy papers waiting for them, the miserable bosses and the sense of inertia that must be handled every hour of every day in their flat-line lives. We enjoy the win and the feeling of being fresh from the battle; We swan to the ice cream shop and with those first licks anticipate the clear welcoming waters of the Red Sea tomorrow and who knows where next week. Life’s good. We know fresh adventures are there for the taking. Freedom. I’m aching everywhere and am surrounded by bags of wet, muddy kit, a few hundred metres of ropes with the rigging knots still in them, and my caving harness, lights and technical kit are all in a great heap as evidence of a really great caving trip. Rowten Pot in Yorkshire is a cave that I know fairly well and is part of the West Kingsdale system that connects through to the Kingsdale Master System via some exciting sumps. We were super keen to try the Great Gully Route which is a relatively new route into the system. It really is a great one and offers a lot of excitement with complex rigging, airy exposed traverses, waterfalls, big swings, long abseils and a huge amount of hard physical grunt being rewarded by the necessity of repeating the whole thing to get out. After three hours of technical work we arrived at the bottom and could finally come off our ropes and walk through the passage that reaches the famous Rowten Sumps. It was great to be there again as the last time I was in that place I had come through from the other side on one of those fabulous memorable ‘invincible diving’ adventures. I had previously been through much of the Kingsdale Master System and it’s other side, Rowten Pot. Those trips had always been beautiful, exciting, hairy, exhausting and very wet. And it seemed to make sense to join them up by diving the sumps. I heard that they are only short with the first being about 3 meters, the second 5 metres and the third 7 metres. So the problem is obvious; Do you take full cave diving gear for just that very short time underwater or just hold your breath and go for it? We discussed it for days and our moods swung between the excitement and anticipation of an adventure, to the fear over stories of fence posts and barbed wire lurking in the sumps having been washed down in floods. It was clear that taking full cave diving gear was just too much work for those occasional ‘ducks’ through very short sumps. So we went for a breath-hold trip wearing thin wet suits, walking boots, caving helmets and lights and dive masks. It’s a complex place and it took hours to find the right place. We heard that ropes are sometimes left in place and sure enough we had found a thin nasty looking rope going into the sump. I had heard that the sumps are often clear, running water but this was very still, brown and silty. We checked our survey and convinced ourselves that this was right and so I went for it. But it just didn’t feel right – zero visibility, it was tight, my shoulders scraped along the walls and I wasn’t sure I could turn around if I had to. I went a lot further than 3 meters and with no sense of an air bell I squeezed round and made it back. Only to be told by Ross "come on give it another go we’re in the right place". So I went again and this time I really went for it and reached the point where I needed that air bell right now. But it wasn’t there and I had a desperate pull back to the start. When I arrived there gasping Ross said it’s OK we’ve found the right sump it’s just round the corner! And there it was, clear water and a big friendly looking rope in place. I went through and it in only a few seconds was inside an air bell about the size of a kitchen table. The other three joined me and then I went off for the next one. I popped into it easily as the water was crystal clear but as I came to the surface I joined about fifty yellow plastic ducks! The others came though and we just treaded water and laughed like maniacs. I then went for the last and longest sump and it was a real cruise – clear water, gravel bottom, smooth ceiling and then easily popped into the bottom of Rowten Pot. It was a great feeling – we had travelled light and had a great laugh sharing a brilliant adventure. But today when I looked at that long sump from the Rowten Pot side the water looked still, a bit murky, unfriendly. Maybe it’s because I was geared up for a relatively dry technical caving trip. I reckon if I’d had my wetsuit and mask I would have felt invincible again! I am just back from Africa filming my new BBC documentary on early Antarctic explorers (after their polar journeys some went to Africa for farming and mining work). Last weekend was the annual Marguerite Bay Reunion here in Windermere (you know the scene – packed bar, all of the old stories coming out). And a perfectly timed letter arrived yesterday from the Antarctic Place-Names Committee that says I have a beautiful Antarctic peak named after me. ROSE BLUFF. So it’s only natural that this very happy Antarctic themed patch brings Antarctic diving to mind. When diving in support of the near-shore marine science programme was moved from Signy Base to my base, Rothera, I was very disappointed for my Signy colleagues. They had been running a world class marine science programme for many years and it was a difficult move for them. But then it meant my work as Base Commander became even more challenging and personally rewarding. We were building a new laboratory at Rothera and a large section of it was being custom built as a top dive facility complete with a treatment chamber, aquaria marine labs and workshop. Along with that we upgraded our boating section and at last we had a proper RIB and inflatable fleet, a boathouse, launching ramp, trailers and generally enough diving and boating paraphernalia to get to work. In those early days of diving at Rothera every single dive was a world’s first. I shall never forget the feeling of dropping off the side of the runway, through a hole in a metre of sea-ice or rolling of a boat and feeling the bite of the -1.5C water and then drifting down to find new species, deploy science experiments, take core samples, collect beasties, recee new sites and always being aware that no one had been here before. It really was pioneering diving. We learned a lot. For instance; I found that the low atmospheric pressure that we take for granted in polar regions is so low that even at sea level we sometimes used altitude dive schedules. One of our divers complained to me a few times that he was having a skin reaction to the new biological washing powder. It was weeks before I put the puzzle pieces together and realized that he was getting skin bends. Whilst searching for a lost sediment trap in deep water I was run over by an iceberg the size of a city park and to this day feel lucky to have got away with it. And I learned how marvelous it is to dive with the world’s top marine scientists and when I asked them what some of the beasties were they had never seen anything like it. 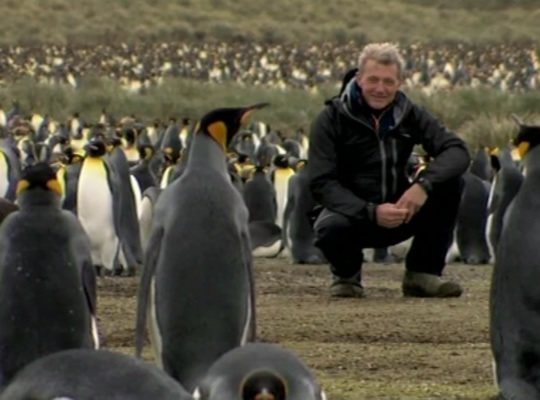 In a couple of weeks I head back to Antarctica by way of the Falkland Islands and South Georgia to continue the BBC filming about the heroic explorers. I could never come close to their skills, toughness and experience. But those years of diving at Rothera have given me a sense of their pioneering spirit. I’m looking forward to this; Every month I’ll be here with up-to-date news, behind the scenes stories and even opinions. Ideally I’ll write these from exotic, challenging and remote locations – but at the moment it’s from the dreaded desk. I have Hero of Russia, Anatoly Sagalevich’s business card right here as a reminder of our 302m dive together in his Mir submarine to the bottom of Lake Geneva a couple of weeks ago on a micro-pollutant project. My cave diving gear is lurking at the end of this kit room and is ready tell stories of diving Dan’s Cave in the Bahamas with the great man Wes Skiles and how he was so relaxed that he fell asleep and dropped the camera during the dive. It’s also ready to explain why I had such a long deco stop on that dive because in the zero vis I spent ages inside a tree. The re-breather is wondering when it can speak about those hours spent on the sea mounts in the Sea of Cortez looking for hammerheads and not finding even one. 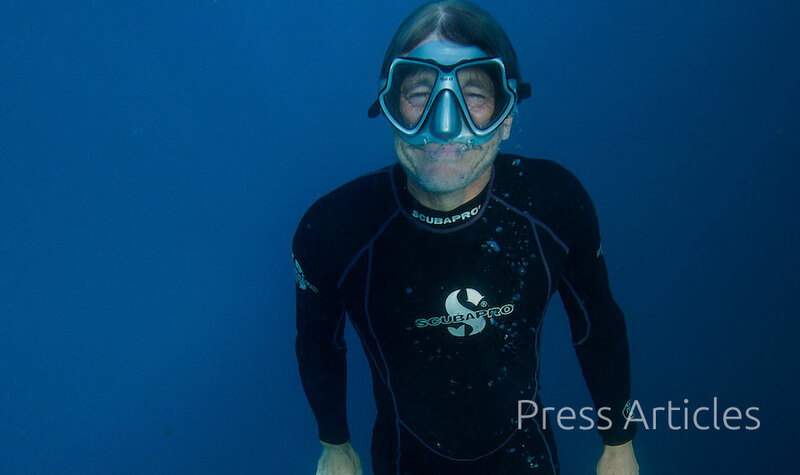 The very same sea mounts that I remember Jacques Cousteau diving with hundreds of circling hammerheads above him. Shark fin soup has a lot to answer for. The small shard of beautiful obsidian on my windowsill is a reminder of Red Sea diving and was last used by one of our primitive early ancestors one hundred thousand years ago at Abdur in Eritrea. He would have used it to shuck shellfish and by living there for a few thousand years they developed bigger, smarter brains and means that Abdur was the one of the launch pads for human development. It’s also why I take that Omega 3 every day - I still have the long arms and am handy with the tools but am happy to try for a bigger brain too. The admin on this desk has got ludicrous tales to tell of great Red Tape Challenges such as trying to keep our beer hidden from port authorities by running it around the boat in relays in a tropical diving version of a Brian Rix farce. Drysuits here on the rack echo with polar diving and those years of diving in Antarctica with the world’s best marine scientists and the wonderful sense of discovery that comes with finding new species. And they speak about being run over by an iceberg and diving under the Arctic sea ice. They also bring back memories of confusing skin bends with an allergy to laundry detergent. And the general sprawl of SCUBA gear, suits of all kinds, crates of weights, homemade and commercial lift bags, odd backpacks, books, and boxes of assorted masks, fins, straps, hoses, fittings and spanners are all conspiring to burst out with 42 years of diving tales. I’ll communicate with all of this gear and look forward to sharing it’s stories with you in the coming months.